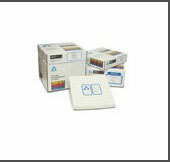 These plates are 100% H20 resistant and are compatible with aqueous developing solvents. They are less rugged than the plates with organic binder but still provide improved handling and sample application compared to Silica Gel G UNIPLATES and are tough enough to write on with a soft pencil, if required.Hard Layer UNIPLATES with inorganic binder are recommended for all applications including those where visualization occurs through strong charring procedures or in any case in which reagent interaction with an organic binder occurs. ·Suitable for aggressive visualization procedures. ·Standard scoring for 20x20 cm plates yields four 5x20 cm plates. ·Channeled 20x20 cm plates have 19 channels. ·Fluorescent plates are ideal for UV shadowing.